Most of us know Yu-Gi-Oh! as the anime that inspired a very popular card game. If you've ever seen the original anime that was Americanized for stateside viewing then you might think you know just what the manga entails. You'd be wrong, though. I first of all wish to point out that there are two anime based off of the original manga. The first anime was simply known as Yu-Gi-Oh! and has yet to be licensed for an English translation. In that particular anime Kaiba's hair is actually green, by the way. The second adaptation is known as Yu-Gi-Oh! Duel Monsters and that is the version that pretty much all of us know today as Yu-Gi-Oh! in the States. Both adaptations of the manga were heavily edited, though. Although I've only read the first volume I can back up that claim with quite a few examples. However, what I really want to stress for anyone wishing to start the manga is this: Don't expect a million duel monster battles. In fact, the first volume doesn't feature a single card game, a duel monster, or anything remotely resembling Kaiba. Kaiba isn't even introduced until later in the second volume. So there are no duels happening in the first volume. I know I sound like a broken record, but I want to get that point across. This isn't the Americanized television series nor is it the original adaptation that came before that most people haven't seen. This is the manga. The art is a lot different, too. So are the names. Tea, Joey, and Tristan are all familiar to fans of the anime, but the manga calls the characters by their original Japanese names. Tristan Taylor is Honda Hiroto. Joey Wheeler is Jonouchi Katsuya. Tea is Mazaki Anzu. It may take a minute to get used to the original names, but I don't think anyone will miss the English names anyway. Chances are if you want to read the manga then it is because you want to know the real story. Well, this is the real story. 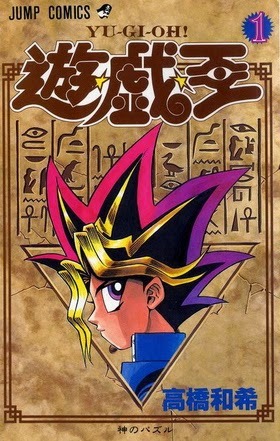 This volume consisted of seven chapters that essentially introduce us to the main characters of the series, including Yami Yugi and Yugi's grandfather. However, there are some noticeable differences in terms of art style. To my eyes, Jonouchi looks the most different from his anime counterpart although I think he (and everyone else) begins to look more anime-like as the series progresses. Before I conclude this review I want to describe the Shadow Games as this volume describes them. Indeed, there are no card games duels in this volume, but there are duels of a certain sort called Shadow Games. These Games began not too long after Yugi finally managed to finish putting together the ancient Egyptian artifact called the Millenium Puzzle. Whenever Yugi gets frustrated or pissed Yami Yugi comes out from the Millenium Puzzle box, possesses Yugi temporarily, and then challenges the wrongdoer to a Shadow Game. The loser essentially loses his sanity (or his life) while the winner lives to see another day. Kinda like a more screwed up version of The Incredible Hulk. In chapter four a man breaks out of jail and holds Anzu hostage at the fast food restaurant where she works. Yugi and Jonouchi happen to be there, but there is nothing they can do since the guy has a gun, right? Well, this is where Yami Yugi takes over and challenges the criminal to a game that Jigsaw from Saw might approve of. The goal of the game is for Yugi and the criminal to move only one finger of their choosing, but none of the other fingers. Yugi chooses his thumb while the criminal chooses his index finger so he can pull the trigger. Unfortunately, the criminal has a cigarette in his mouth and a bottle of booze pouring into a glass in his non-gun hand. Yugi gently places a lit lighter onto the man's pouring hand after lighting the guy's cigarette for him. While the alcohol keeps overflowing the glass, the criminal is incapable of moving his hand or else the lighter will tip and he'll end up catching himself on fire. However, the irony is that he drops his lit cigarette from his mouth first because he was so nervous about moving his hand. And then the guy gets burned alive while Yami Yugi walks away from the scene in total badass fashion. Yeah, this ain't the Yu-Gi-Oh! you might remember. There's a reason the manga is rated T for Teen. Personally, the manga made me become a much bigger fan. I do hope there are some card games in the not too distant future, though. Because it just isn't the same without the Dark Magician.